How strong is the Four Knights? April is by far the busiest month on my chess calendar (although March is almost as crowded). With the Doeberl Cup and the Sydney International Open running back to back, the second half of the month is almost entirely taken up with chess. Throw in the Dubbo Open (9th&10th April) and the start of the ACT Junior Chess League Development Squad, and my lawn is getting mowed once this autumn. And speaking of the Doeberl Cup, entries have just reached the 150 player mark. Importantly for anyone wishing to play in the Premier, there are only 28 places left. To maximise norm chances this event is limited to 90 players, so if you don't want to miss out entering within the next week is recommended. Round 7 of the ANU Masters saw the players return to action after week off. The Ikeda v Chibnall game was over fairly quickly after Chibnall dropped a piece early on (her second disastrous Ruy in the past month). Ian Rout defeated Michael Reading after winning material in the middlegame, while Jeremy Reading found a nice rook sacrifice against Adrian De Noskowski to generate a winning attack. Andrew Brown found a novel path to victory by sacrificing a piece (to go a rook down) in the hope his pawns would overwhelm Miles Patterson's extra rook. While deciding whether the piece could be taken or not, Patterson lost on time. The final game to finish saw Peter Pullicino go from promising position to a lost rook and pawn ending, which Andrey Bliznyuk converted without trouble. Andrew Brown continues to lead the event from Junta Ikeda by half a point, with Andrey Bliznyuk a point back. The Four Knights is one of those openings that was popular until the 1920's , when the Hyper-Moderns began to change the way we looked at openings. Players liked Capablanca, Rubenstein and even Nimzowitch debated the merits of it, without it being declared definitively bad. 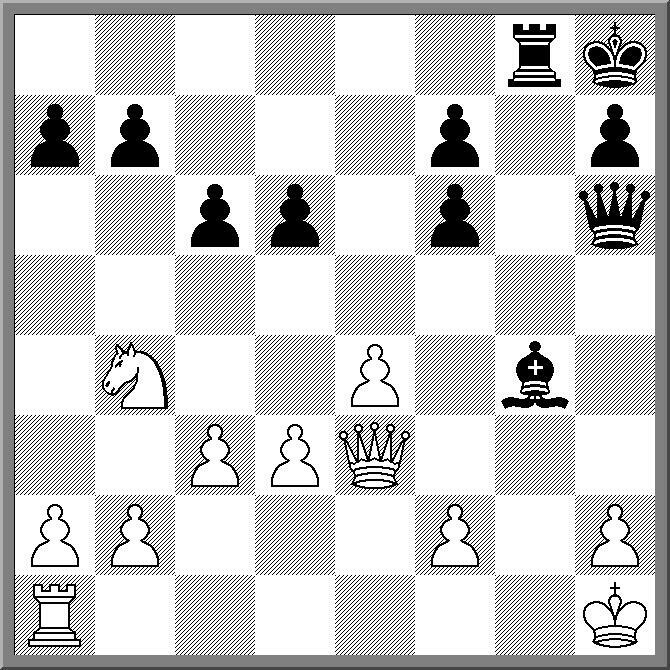 At worse one could say that as an opening, White found better things to do on move 3. It does turn up from time to time (eg Short v L'Ami 2009) but every appearance seems to have an element of surprise attached to it. The latest high level outing was at the current European Championship where Ivan Popov used it to draw with Peter Svidler. A lot of the game looked like home prep, and although it only earned Popov half a point, this might be considered a success given the rating difference between the two players. However, before you decide that the Four Knights is good for an easy draw against any 2700+ GM, it is worth noting that Svidler probably let Popov escape a little easily, as 17. ... Kd8! 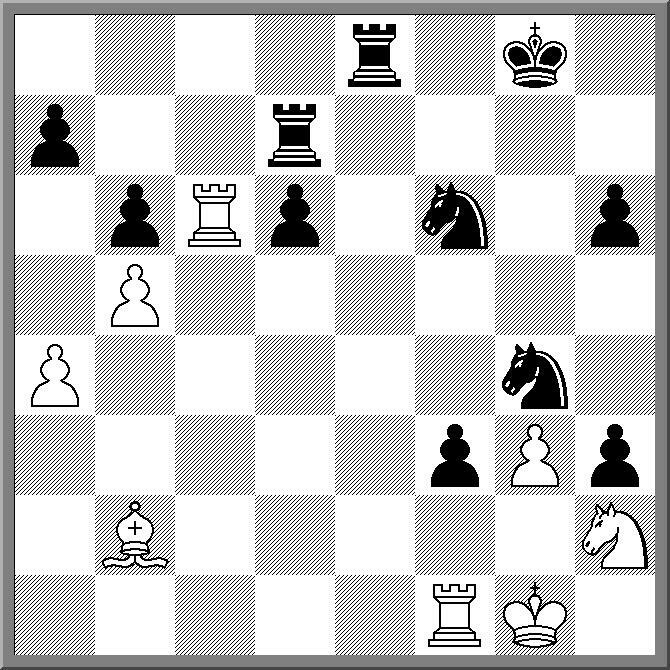 18.exd6 Bd7 still offers Black good winning chances. Another book I picked up at the Lifeline Bookfair was "A Short History of Chess" by Henry A. Davidson. While I haven't read through the book, the introduction contained an interesting passage. In describing how the book came about, he relates that he spent a large amount of 1943 based in Northern Australia, while serving in the US Army. He said he played a lot of chess, often with the Australian staff of the nearby Army Hospital. He states "Aussies are chess minded. They like the game, play it often, and play it well"
The passage jumped out at me, simply because conventional wisdom is that Australia is not a chess country, and attempts to popularise chess are much harder than in other parts of the world. But like most statements of this type (board generalisation, no supporting evidence supplied), it is only true until it becomes false. In various older books in my library I've seen the claim repeated for a number of other countries around the world. Often it was of the form "we will always lag behind the USSR because they have a cultural affinity for chess and we don't". Countries that spring to mind include England, France, Italy and even the USA. Of course these claims were made when chess in those countries were at a low ebb, and fade away as numbers and success improve. Striking examples of such improvement include England in the 1980's, and France and Turkey more recently. (In the 1972 Olympiad France finished top of the D section, with Singapore, Malta and Hong-Kong filling the next 3 places!). So the "we don't have the culture" excuse is, I believe, a pretty weak one, and has more to do with a will to succeed, or lack thereof. The ACT junior chess scene is undergoing a little bit of a generational change this year, with the top players of the last couple of years starting to move on (to senior schooling/university), and the younger high school players coming in to replace them. An example of this is the 2011 ACT Junior Autumn Weekender. Previous years contestants such as Josh Bishop. Matthew Bennett, Alana Chibnall, Allen Setiabudi and Emma Guo were missing this year (although they were all at Street Chess today!). Instead the field was headed by Michael Kethro, Stu Mason, Jamie-Lee Guo, Harry Press and Ethan Derwent, who are all in the 11 to 13 years age group. While there is a tendency to look at such things an exclaim that this years event wasn't as strong as previous years events, such comparisons have been made for years, including the years when players like Yi Yuan, Andrew Brown, Junta Ikeda or Michael Wei were just starting out. This years event attracted a solid field of 33 players, which is around the number that has played for the last few years (but nowhere near the 70 who played in 2003). After 3 rounds, Michael Kethro and Harry Press share the lead with 3/3, and will play on the top board in tomorrow mornings round. That great Canberra tradition, the Lifeline Bookfair, kicked off again today. Normally I am an early arriver, trying to get there before the doors open (although I am not one of the 6am queuers). However a recent shift of a weekly work meeting to Friday morning meant I had to wait until lunchtime to see what second hand books were to be had. Of course my concern was that all the chess books would be gone before I arrived, but I'm pleased to say this wasn't the case. In fact there was quite a large selection of books, although a selection that contained a high percentage of books I already have copies of. That didn't stop me picking up about 9 new titles, including a signed copy of Edmar Mednis's "King Power in Chess" for $4. I even picked up a trio of books on Go, which was also well represented this year. As I will be busy as an arbiter at the ACT Junior Autumn Weekender for the next 2 days, this was my only trip to the bookfair. So if anyone else wants to grab some chess books (or Go books), I've left plenty behind for you to choose from! Watching cricket seems to have trumped blogging as a priority this evening. Normal service should be resumed tomorrow! 393 players. 163 Grandmasters. The bottom half of the field starting at 2432. These are some of the features of the 2011 European Championship, which started last night in Aix les Bains, France. This huge tournament has become one of the centre pieces of the European Chess Union, with a number of qualifying spots for the World Cup up for grabs. Given the strength of the field the first round saw a number of upsets, but I was surprised at what happened on the top 10 boards. 6 of the 10 games were drawn (including a 19 move draw on board 1), while 5th seed Dmitry Jakovenko even lost to an opponent rated 293 points below him. Further down the results began to appear more 'normal' although a couple of high profile players still struggled against lower rated opponents. This may have an interesting effect on the tournament as the normal strategy of getting to +4/+5 and drawing your way to a qualification place may be complicated by a number of top seeds hacking their way back into contention. Information can be found at the official website, and results can be found at chess-results. I'm a fairly late adopter of a lot of internet trends. One fad that passed me by was Second Life, which is a free form 3d virtual world. However I thought it was time to dip my toe in the virtual pool, and decided to create a virtual me. It was a fairly easy task, so much so that after 5 minutes I wondered what the fuss was about. So I went looking for a chess club. Turns out they exist in Second Life, although when I visited, there was no one about. But the boards were set up, and as it turns out, quite usable. So with no one to play, I did a little bit of analysis of one of my correspondence games, and even found a winning line (I'll publish the game once it is over). The place where I've spotted a virtual chess board is in the game Call of Duty Black Ops (played by my son on a regular basis). In one of the multiplayer maps there is a house with a chess set in the living room. My son even took time out from trying to shoot his 12 year old friends in the head to try and analyse the position on the board. However he quickly noticed that the designers had committed the cardinal sin of placing the board around the wrong way (bottom right hand square was black) and decided to put three shots into board instead. Chessvibes has full coverage of the decision in the case of the French Chess Federation versus GM Feller, GM Hauchard and IM Marzolo. They were found guilty of "a violation of sporting ethics", based on certain incidents at the 2010 Olympiad. The allegations made against the players concerned the use of computer assistance given to Feller, from Marzolo via Hauchard. While the Chessvibes article has all the details of the case, the alleged system was that Marzolo would text the move to Hauchard (the French Captain), sitting in the bar, who would then enter the playing area and pass the move to Feller via a system based on standing behind specific players in the French match (each player being both a letter and a number, requiring 2 or 4 circuits of the table the match was played on). The text messages were designed to look like phone numbers, with the actual move represented numerically. While this decision has just come down, and the players intend to appeal, it should have ramifications for tournaments and tournament organisers. The push to implement a delay in live broadcasts (eg moves held up by 15 minutes or more) is likely to gather pace. Also restrictions on mobile phones/communication devices may be extended further, with spectators not allowed to carry them (As an aside, I started to do some on-the-spot blogging from the back of the grandstand in the main playing hall of the 2010 Olympiad, using my netbook. I was quickly spotted by one of the section arbiters, and politely, and correctly, asked to leave, which I did). Here is one of the games that was investigated by the FCF. It is a win by Feller over Howell, with 19. ... Nc2 being the stand out move. Last year the Correspondence Chess League of Australia sent out a survey form, in part to find out where the League was at, both in terms of demographics, and in terms of whether it was meeting membership needs. For an organisation with a membership of a little over 300, a surprisingly large number of 90 forms were returned, with some interesting results (NB Self selecting surveys should be taken with a pinch of salt). In terms of utilising 'modern' technology, there is a still a large percentage (>60%) who both prefer to play CC via post (rather than webserver or email), and to recieve the League's magazine ACCQ in printed form. And speaking of ACCQ (of which I am the current editor), there are plenty of suggestions about what the members want to see in the magazine (problem pages, educational articles, player profiles etc) and I will be looking at adding those to future issues. When I'm called upon to put together a collection of puzzles (usually for coaching or magazine articles) there are a number of names that pop up again and again. Now given that I am not really part of the 'problemist' tribe (I'm hopeless at both composing and solving) I don't know much more about the composer than possibly the type of problem they seem to do well. For example the given study is by Selesniev, and if my memory hasn't failed me, I've seen a number of other rook endings with his named attached. I do like this one, and it is reminiscent of the Saavedra study, in part. To help you along your way, the first move is the obvious one (1.f7) but the challenge is how to deal with Black rook trying to skewer the king and pawn/queen on the f file. Most of the time I surf the web using Google Chrome, although I also use Opera on occasion. Recently Google have decided to go down the 'App Store' path, by offering applications and extensions that run in your browser. Obviously I have looked at the chess offerings, and they are at this stage a mixed bag (although shredder chess is good). Obviously this is part of the trend towards running more and more stuff remotely through your browser, rather than having it installed on your machines. The assumption behind this is that we are rapidly becoming a 'wired' (or 'wireless') society, with connection to the internet being a permanent thing. Certainly this is a reasonable expectation (at least in industrialised countries), but it does depend on being able to access these services. At the moment I am looking at mobile broadband as a way of solving the hotel extortion/no wireless available/can't find an internet cafe problems I have when I travel (for blogging/game broadcasting purposes), although I must say I'm not really impressed what is on offer in Australia. The usual equation of expensive rates/restrictive usage conditions is the major problem, but the desire for comprehensive coverage is also a constraint. The upshot of it is that while I really want to join the 'all interent all the time' world (and avail myself of the online service model), it is not as easy as I thought. And it is these issues that not only affect me, but may also affect those offering the services. While we like to think that we all belong to one big community of chessplayers, like any community, there are a number of smaller tribes that we 'really' belong to. For example, I like to think I belong the tribe of 'club players', in that I play once a week at my local club, and have done so for pretty much my entire chess career. 'Too busy to play' tribe - Studies chess, subscribes to magazines, keeps up with latest news, even comes to all the tournaments, but never has the time to actually play! 'Where do we drink' tribe - Normally ex-juniors players now in their 20's. Only play events with a well stocked bar and plenty of mates. Unlike the last couple of rounds, the 6th round of the 2011 ANU Masters saw a number of upsets and near upsets. Michael Reading decided that his best chance against Andrew Brown was to try and take him apart with a kingside attack, and at one point it looked like it just might work. He sacrificed a piece for a pawn roller aimed at Andrew's king, but in a familiar tale, decided to take material when pushing more pawns was the better strategy. Andrew quickly consolidated and won with a counter attack. Junta Ikeda went into this round tied for first place with Brown, but in a curious game he was held to a draw by Adrian De Noskowski. Just before the end Ikeda missed a strong continuation that won the exchange, but was still better when the draw was agreed. Alana Chibnall was unlucky not to bag the full point against Andrey Bliznyuk, after launching a very strong attack out of the opening. She was even ahead material, but decided to return some of it to keep the attack going. At the crucial moment she missed the killing move and Bliznyuk was able to make a draw. Jeremy Reading beat Miles Patterson in a that would horrify the positional purists. Both players castled to compromised kingsides, but it was Reading's attack that won the day. In the final game to finish, Peter Pullicino was able to convert a better position in a double rook ending into a winning rook and pawn ending, although Ian Rout still made him work for the point. The Dubbo Open is one of the weekend events that I regularly play in (7 or 8 times over the last 10 years). It is always an enjoyable event, well organised, and with a friendly bunch of players. This years event is on the weekend of the 9th & 10th of April, at the usual venue of the Dubbo RSL Club. The tournament will be a 6 rounds, with 3 rounds on Saturday and 3 on Sunday. Saturday night sees the traditional tournament dinner, followed by a social lightning event. Time limit is G/60m+10s and entry fees are $45/$35/$25 (A/C/J). First prize is $350 with other prizes dependant upon entries. Last year saw a strong field of 48 players, and I'm aware of a number of players planning to make the trip from Canberra. FM Junta Ikeda completed a comprehensive victory in the 2011 ACT Championship, with a win over Josh Bishop in the final round. His score of 8.5/9 is almost certainly a record, and left him a full 2 points clear of second place getters Daniel Abrahams, Andrey Bliznyuk and Wenlin Yin. Abrahams scored the biggest upset of the final round after Andrew Brown dropped a rook while trying to win a drawish position. This left Brown in 5th place on 6/9, with his 3 losses coming against the other top seeds. Stu Mason on 5.5/9 was the highest placed non-FIDE rated player, while sister Jo shared the Under 1200 prize with Bazli Karattiyattil. The tournament attracted 33 players, which was about the same as last year. Once again the format of 9 rounds over 2 weekends was popular with the players that played, but there were a significant number of players from last years tournament who did not back up for this year. With the ACT Chess Association covering the tournament overheads, the prize pool (from the tournament entries) was a very nice $1690. Full results and games can be found at the ANU Chess Club website. Unlike the 2010 ACT Championship, where FM Junta Ikeda allowed his lead to be whittled away on day 4, the 2011 Championship has seen him do the opposite. Going into the 7th round with a 1 point lead, Ikeda won both of today's games, and extended his lead to 1.5 points. This of course means that with 1 round to play, he can't be caught, and therefore is the 2011 ACT Champion. (IM) Andrew Brown moved into second place, also winning both of his games today. Tied for third are Daniel Abrahams, Wenlin Yin, Andrey Bliznyuk and Allen Setiabudi. While tomorrows top board game will be more for pride (and rating points), the next few boards will see players battling it out for the minor placing's (and prize money). Results and games from this event can be found at the ANU Chess Club website. FM Junta Ikeda has maintained a 1 point lead after the third day of the 2011 ACT Championship. In the morning round Ikeda beat second placed Allen Setiabudi, while in the afternoon he drew with defending champion Andrey Bliznyuk. Bliznyuk is one of 4 players tied for second on 4.5. After finishing the first weekend on 3/4, he got off to a good start with a win over (IM) Andrew Brown in round 5. Also tied for second are Daniel Abrahams, Allen Setiabudi, and Wenlin Yin. With 3 rounds to play Ikeda is the favourite for the title, although Bliznyuk (having played the top seeds) is always a danger. Tomorrows morning round will see Ikeda up against Abrahams, and the result of this game will go a long way towards deciding the tournament. There is the oft repeated story of the father who leaves his entire fortune to his son, on the condition that "he never plays QxNP in the opening." In Euwe and Kramers "The Middle Game Book Two" there is a variant on this tale. In there version the fortune is left to the sons "only after they had made a correct Bishop sacrifice on KR7"
The game then given in the book is a brilliant win by Edgar Colle. But whether the sacrifice as played in this game is 'sound' has been the subject to some debate. 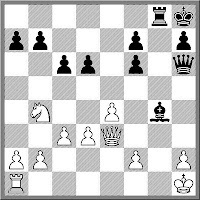 Some old analysis thought it was unsound, if the Black King runs back to g8, although both Baburin, and Euwe/Kramer think that White still has a draw by perpetual. Interestingly they both thought that after 13. ... Kg8 14.Qh5 Ne5 15.Rxe5! Bxe5 16.Qxf7+ Kh8 17.Qh5+ Kg8 White only has a perpetual, but Stockfish quickly finds 18.b3! with a winning position. However 14. ... Qf6 (also given by both analysts) still holds for Black. So if you are playing White, does sacrificing a piece for a draw qualify as 'correct', and do you qualify for your fathers inheritance? After all the big chess events towards the end of last year and into the start of this one, the last month has seen very little activity on this front. Of course it is nice to let the worlds top 10 have a break every now and then (they aren't performing seals after all), but it is just as nice to see them in action once again. The 20th and final Amber Chess Tournament starts on Saturday with it's usual impressive line up of players. This mixed Blindfold/Rapid event has a prize fund of 227,000 euros, which is pretty impressive chunk of change in almost any currency. Last year saw Carlsen and Ivanchuk tie for first, and both a returning to defend their shared title. Ivanchuk, the only player to play in all 20 Amber tournaments, has another motivation for being the final winner, in that he also won the first event (a rapid only), in 1992! It was a night for the favourites, with the higher rated player winning each of the round 5 games of the 2011 ANU Masters. The first game to finish was the Rout v Chibnall game where Alana chose the wrong plan and never got the attack she was looking for. On the other hand Ian did get the attack he wanted, and the game finished with a winning exchange sac. The Pullicino - Michael Reading game swung back and forth, with both players holding a clear advantage at various stages. But an impulsive capture by Pullicino in the ending turned out to be the decisive mistake, and Reading ended up with a winning ending. Ikeda defeated Patterson in a 2.d3 French, with Ikeda finding the knockout punch with a winning piece sac. De Noskowski blundered a piece due to a miscalculation against Bliznyuk, and Brown beat Jeremy Reading after giving up his queen for 2 rooks, and a whole lot of play. After 5 rounds Ikeda and Brown share the lead with 4/5, with Bliznyuk on 3.5 and Rout on 3. The Box Hill Chess Club in Melbourne will be hosting the first FIDE Arbiters Seminar held in Australia, later this year. It will be over 4 days, from the 5th to the 8th of August (alongside the Oceania Seniors Championship at the same venue). This will be the first seminar held in Australia, and attendance, plus passing the seminar exam, is now part of the requirements to become a FIDE Arbiter. Now while some participants will be attending the seminar as a way of getting formal arbiter qualifications, there are of course other reasons for doing the course. The most obvious one is to simply receive some formal training in being an arbiter. I would hazard a guess that most arbiters in Australia, including almost all IA's, picked up their knowledge on the fly, as there have been very few arbiter seminars held in the past. Certainly my own experience was a combination of reading the rule book, and then running a number of tournaments. I picked up some tips from other experienced arbiters (eg Cathy Rogers and Stewart Reuben) but the only course I did was 3 years ago, when I had already been an arbiter for 20 years. Now I don't know how many people plan to do the course, but I hope that it will be a sizeable number, especially given the difficulty that clubs and associations have in finding people to direct their tournaments. As I've pointed out in the past to plenty of people is that arbiting isn't hard, it just requires some knowledge and a bit of self belief. I expect this course to teach both. The first round of the ACT Championship saw one of the more spectacular finishes to a chess game I have seen in recent years. White had been a little too ambitious with his attack, and Black looked like he had the upper hand. But on move 26 White threated to win back material by playing Qe3. However just as he played the move he jumped up from the board and clutched the back of his leg. Clearly in pain he moved away from the board, before going down with a leg cramp. There were attempts to mitigate the pain, but to no avail, and he crawled back to the board, to resign the game. At this point the physio ran onto the playing area to provide first aid, but of course the game was over. Kind of a shame, as the position was not lost by any means. The second day of the 2011 ACT Championship saw the top seeds begin to meet. In round 3 pre-tournament favourites Junta Ikeda and Andrew Brown both scored wins, although Ikeda walked the time trouble tight-rope for the second half of his game, but amazingly managed to win on time in an even position. Allen Setiabudi and Daniel Abrahams kept pace with the leaders after drawing their game, while defending champion Andrey Bliznyuk amoved to 2.5/3 after beating Alana Chibnall. Round 4 saw Brown and Ikeda play on the top board, with Abrahams and Bliznyuk playing on board 2. Ikeda employed his usual 'slow build up' strategy, organising his pieces before opening up the position. When the pawn break came, Brown found his king in the firing line, and after missing a key defensive idea in time trouble, resigned when faced with mate. Abrahams and Bliznyuk drew their game, allowing Allen Setiabudi to move into outright second after surviving an interesting attack from Willis Lo. The tournament continues next weekend, when the final 5 rounds will be played. Results and games are available at the ANU Chess Club website (click on Current Tournaments and Games links). As with open events of this type (smallish field, large spread of ratings), the first day is often about 'pre-sorting' the field, with the real action occurring in the future. A field of 34 players (2 more than last year), entered the tournament, although the field is slightly weaker than 2010. However FM Junta Ikdea and defending champion Andrey Bliznyuk have once again entered the tournament, along with (IM) Andrew Brown. (A number of other strong players were invited to play, but were unable to take part, for various reasons). At the end of Day 1 6 players are on 2/2. They are pre-tournament favourites Junta Ikeda and Andrew Brown, along with Daniel Abrahams, Mos Ali, Wenlin Yin and Allen Setiabudi. Most of the games have gone according to rating, although Willis Lo held Andrey Bliznyuk to a draw in the final game of round 2. Results from the tournament are available from the ANU Chess Club page (under Current Tournaments) along with the games under the Games link. Easter is the trickiest of holidays, as it moves around due to the cycles of the move. As the Doeberl Cup (and other tournaments) like to use the 4 day break to hold their events, the differing Easter dates can both affect the number of entries to the tournament, and the actual holding of other events. This year Easter is quite late in April, and indeed runs over another Australian holiday, ANZAC Day. In the past there have been tournaments organised to take advantage of this normally separate holiday, but not this year (although the Melbourne Chess Club have just decided to organise an easter weekender and call it the ANZAC Day Weekender). However the lateness of Easter has also freed up the normally busy March/April calendar. The Dubbo Open (always popular with Canberra players) is now on the 9th & 10th of April, while the Ballarat Weekender (12,13,14th of March) may benefit from the longer gap between it and the Doeberl Cup. Another from the White=Black files. The following game was one of the longer CC games I have played in recent years. There were a couple of interesting points, including the offer of a queen, and the choice of opening variation by my opponent. His 6th move (Bd2) looks like a novelty, although by playing 8.Bg5 he transposed back into theory, with one important exception. As he took two moves to get his bishop to g5, while I played Bg4 in 1 move, we effectively swapped colours, and as long as I remembered I was playing 'white' I could follow existing theory for a number of moves. As for the queen offer, he did something that you can't do in over the board chess, but is perfectly ok in CC. "nice move but i not novice :)" was his comment after declining the offer. I decided not to reply after I won his queen a few moves later. The 2011 ANU Masters now has joint leaders after FM Junta Ikeda defeated (IM) Andrew Brown in their round 4 game. The opening was a Queens Indian, and at first Brown looked better with the two bishops and more space on the queenside. However Ikeda struck back in the centre, and eventually trapped Brown's queen after it went on a pawn grabbing excursion. Alana Chibnall broke her duck for the tournament with a win over Peter Pullicino. Her choice of a closed sicilian resulted in better posted pieces, which was enough to win the ending. Ian Rout defeated Adrian De Noskowski after the latter seemed to lose control of the position early on. Rout won material with a nice tactic and quickly converted it into a mating attack. The FIDE Chess in Schools Commission has launched a competition to find the best videos on the subject of schools chess. The videos themselves are at their video site, and each month there is a vote for the best video. I'm not sure what the best video wins (apart from fame and glory) but one lucky voter wins a prize. Click on the above link for full details and the to watch the videos (including one from Australia).